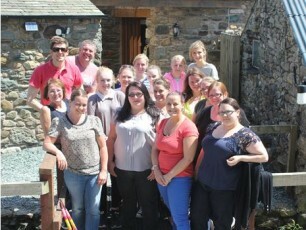 On the final weekend of June, 20 members of staff travelled to Rookin House Activity centre in Penrith, Ullswater for Bromleys’ annual Bonding Weekend. We arrived on the Friday night to beautiful weather for a Barbecue , and were up early on Saturday for a day of activities. We started off with archery and ‘Powerturn’ vehicle driving (a kart type vehicle with separately powered left and right wheels), we then moved a ‘Leap of Faith’ challenge which involved climbing a tree to a 20ft high platform and leaping off (harnessed of course!) to hit a target suspended 6 feet away. Following this, we had a group assault course comprising a 6 foot wall, a climb up a cargo net over a 10 foot high telegraph pole and a 12 foot wooden ladder. Finally, we split into two teams for a raft building competition and race around the lake before having a friendly game of Rounders and another barbecue. Sunday involved air rifle shooting and go-karting before we all journeyed home aching, bruised and exhausted – all classic signs of a good weekend!